We have a number of scenic drives in the area. Moralana Scenic Drive which takes you on a journey between the Hawker to Wilpena roads and the Hawker to Leigh Creek road. Brachina Gorge also links two roads, Wilpena to Blinman road and Hawker to Leigh Creek road. Bunyeroo Gorge also links from Wilpena to Blinman road to the Brachina Gorge road. The Hawker to Blinman road is also a pleasant drive. While at Blinman take a mine tour have a drink and a meal at the hotel or buy a pie at the shop. The Parachilna Gorge is the road between Blinman and Parachilna, the road at times can be stoney like many other roads in the Flinders, the condition of which is dependent of the seasons. In year plentiful rain the springs and creeks can have running water, adding to the beauty of the drive. 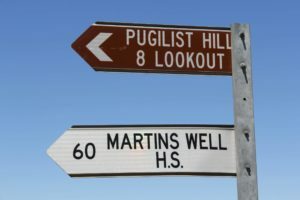 Just north of Rawnsley park turnoff is the road to Martins Well Station and Pugilist Hill lookout. From Pugilist nice views of Rawnsley Bluff, Chace Range and general scenery, don’t forget your camera. Pugilist Hill is Altitude: 552m. 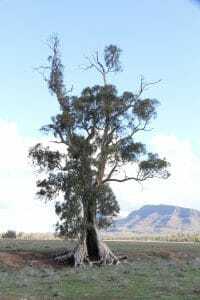 Visit the Adelaide Bushwalkers website Cazneaux Tree .